Uterine smooth muscle tumors are neoplasms composed of smooth muscle; they range from benign leiomyomas to low-grade and high-grade leiomyosarcomas. Several histologic subtypes exist, including usual (spindled), epithelioid, and myxoid tumors. Leiomyomas are the most common benign neoplasm in women; it has been estimated that these tumors occur in at least 25% of all women, which is probably an underestimation, because this figure is based on a select population (ie, women with symptoms or women who undergone hysterectomies or imaging for a variety of reasons). Leiomyomas are more frequent in black women. Leiomyomas and leiomyosarcomas are believed to develop independently and are not progressive. This belief is based on population studies, as well as genetic and cytogenetic profiles of these tumors and the fact that they lack shared mutations and transformations. There is little known about predisposing factors for the development of leiomyosarcomas. The majority of uterine smooth muscle tumors occur in the corpus, but the cervix, vaginal canal, broad ligament, and ovaries may also be involved. Within the corpus, the tumors are categorized on the basis of their anatomic location. Mucosal leiomyomas occur in the endometrium; they often fill the endometrial cavity and protrude through the cervical os. Submucosal leiomyomas occur within the myometrium. Serosal leiomyomas project from the serosal surface. Most leiomyomas are found incidentally. Those that occur in mucosa or are of large size may cause irregular bleeding, pelvic pain, and infertility. Leiomyomas are usually difficult to palpate on physical examination unless they are large. In such cases, the uterus is typically sized in accordance with the sizes that occur during specific weeks of pregnancy. Leiomyomas are often responsive to hormones. In premenopausal women, myomectomy may be performed to try to reduce symptoms and preserve fertility. Leiomyosarcomas are usually asymptomatic until they reach a size large enough to cause pain or bleeding. In cases in which the initial radiographic impression is not worrisome, rapid growth during the interval between imagings is an indication for resection. Most leiomyosarcomas occur in perimenopausal and postmenopausal women; the average age of a woman with leiomyosarcoma is 50 years. However, premenopausal women may develop leiomyosarcomas. Most leiomyosarcomas metastasize within 2 years of diagnosis. Leiomyomata have a characteristic gross appearance: that of a well-circumscribed, dense, whorled, tan-white, spherical mass. These lesions tend to be multiple. When they degenerate, leiomyomata may assume a red discoloration, called carneous degeneration (the nodule looks like skeletal muscle). After infarction, the tumor may have gelatinous regions as a result of edema. The leiomyoma/myometrial interface is smooth and very well circumscribed (see the image below). When there is an infiltrative border, the nodule most likely represents adenomyosis (which may simulate a mass) or a sarcoma (ie, leiomyosarcoma or endometrial stromal sarcoma). The myometrial tumor interface of a myxoid leiomyosarcoma. Note the splaying of the normal myometrium by the myxoid stroma rather than a smooth border. In appearance, leiomyosarcomas of the uterus have features that range from those similar to leiomyoma (rare) to overtly malignant, gross features similar to those of high-grade sarcomas that may occur anywhere in the body, with infiltrative edges, necrosis, hemorrhage, and a variegated cut surface. These tumors are usually more than 5 cm in greatest dimension, but a uterine mass of any size that has features different from the usual whorled, white, cut surface of a leiomyoma should be sampled. Occasionally, mucosa-based smooth muscle tumors protrude through the cervical os and develop a necrotic tip. Recognizing usual smooth muscle is usually straightforward; it is characterized by interlacing bundles of uniform spindled cells with long oval nuclei with blunted ends and tapering bipolar cytoplasmic processes. Owing to the fascicular arrangements, the nuclei appear small and round when cut in cross-section but long and oval when cut longitudinally (see the following image). 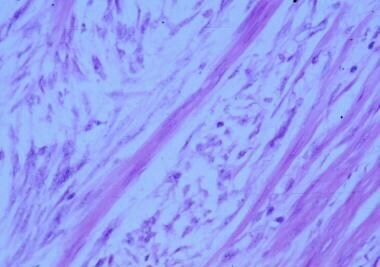 Normal fascicles of smooth muscle. Leiomyomas occasionally have small but conspicuous nucleoli and mild nuclear border irregularity. Occasionally, a leiomyoma has hamartomatous components such as fat, cartilage, and bone; such tumors are named in accordance with the component features (eg, lipoleiomyoma, chondroid leiomyoma) and have no bearing on malignant potential. 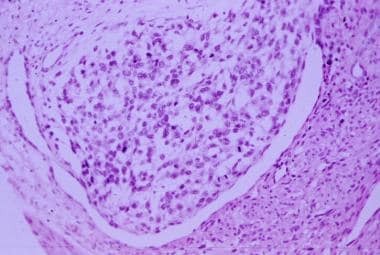 Rarely, the smooth muscle cells appear basaloid and less fascicular and resemble endometrial stroma, raising the possibility of a stromal nodule or, of more clinical importance, endometrial stromal sarcoma. In such cases, histologic clues that the neoplasm is smooth muscle include fascicular growth and large-caliber vessels. Differentiation by immunohistochemistry may be helpful, but unfortunately, it is not always enlightening (see Immunohistochemistry). Assessment for infiltrative borders characteristic of endometrial stromal sarcoma is helpful. Although benign, leiomyomata may grow to extremely large sizes (20-30 cm). Although in soft tissue such a tumor would by definition be considered a malignancy, this is not true for tumors occurring in the uterus. Owing to hormonal influences, leiomyomas may be very hypertrophic and mitotically active. It is common for infarcts to arise. These are usually easily recognized by the scar formation along the periphery of the infarct (classified as hyaline necrosis) (see the image below). Additionally, in an infarct, the smooth muscle and vessels are necrotic. Hyalinized necrosis characterized by scar formation. After an infarct, the leiomyoma sometimes undergoes hydropic change. The loosened matrix becomes edematous, giving a myxoid appearance to the lesion. A clue to hydropic change is the presence of large vessels floating in empty space, with the smooth muscle cells pushed to the periphery. Reactive atypia and increased mitoses are frequently seen adjacent to an area of infarct; therefore, cytologic atypia should be assessed away from regions of necrosis or infarct. Leiomyosarcomas are rare and are usually easy to diagnose. Evaluation of the following 3 features continues to be the most reliable means of assessing malignancy: mitotic activity, tumor cell necrosis, and cytologic atypia. Given the importance of these features, each is discussed below. By itself, the mitotic index is not an independent predictor of malignancy. Mitotically active leiomyomas are well studied and reported. 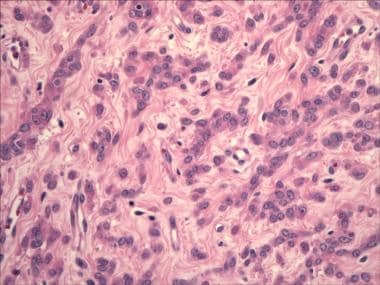 These are defined as smooth muscle tumors with up to 20 mitoses/10 high power fields (HPF), but they are devoid of atypia and tumor cell necrosis. Although this feature alone does not denote malignancy, when other worrisome features are present, mitotic activity becomes extremely important in assessing malignant potential. To measure the mitotic index, find the most mitotically active area of the tumor (but avoid areas adjacent to hyalinized necrosis) and count 10 HPF (40×). Apoptotic bodies, degenerating smooth muscle cells, and infiltrating lymphocytes may sometimes simulate mitotic figures; therefore, mitotic counts should only include definitive mitoses. If more than a single atypical mitotic figure is found, vigilant assessment is warranted; the tumor should not be categorically classified as benign. Multiple diagnoses may be considered, including atypical smooth muscle neoplasm, low-grade smooth muscle neoplasm, and leiomyosarcoma. The adjacent nonneoplastic myometrium may be used as an internal control for the patient's baseline smooth muscle histology. Typically, leiomyomas have only slightly larger cells and focal nuclear membrane irregularities. Cytologic atypia is assessed by determination of nuclear size, examination of membrane contours, and evaluation the prominence and number of nucleoli (see the image below). Leiomyosarcoma demonstrating marked cytologic atypia. It is well known that in the absence of other features, focal severe cytologic atypia is usually benign (perhaps akin to ancient change in other tumors, such as schwannomas). These tumors used to be called symplastic leiomyomas and are now classified as leiomyoma with atypia (see the following image). Diffuse severe atypia is not a typical feature of benign tumors and should be evaluated with great care. In such cases, the mitotic index aids in classifying the tumor. 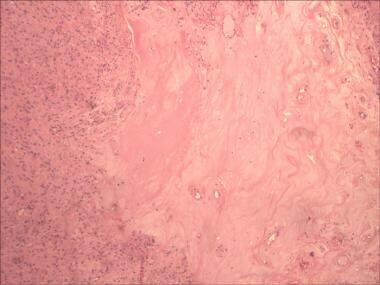 Leiomyoma with atypia (formerly called symplastic leiomyoma). Note the focal nature of the severe atypia. By definition, tumors of this type are devoid of tumor cell necrosis and mitoses greater than 10 mitoses per 10 high power field (HPF). Of the 3 features discussed, coagulative tumor cell necrosis seems to be the most predictive histologic feature of malignancy. 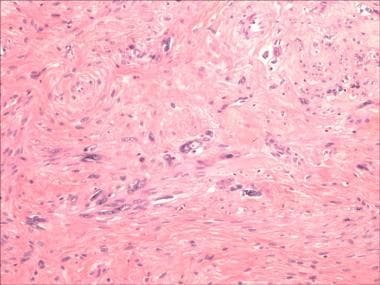 The biggest problem is recognizing it and not classifying it as an infarct/hyalinized necrosis. Coagulative tumor cell necrosis is characterized by an abrupt change of viable myocytes adjacent to necrotic myocytes without an intervening sclerotic edge (which is characteristic of infarcts) (see the following image). Individual necrotic tumor cells (ghost cells) are usually discernible, and the vessels are usually still viable. If there are large areas of hyalinized necrosis and a focal area suspicious of tumor cell necrosis, levels may sometimes aid in identifying a sclerotic edge and confirming younger infarcts. Additionally, if a myoma was embolized before surgery to control bleeding, the histologic features will resemble tumor cell necrosis, although the vessels within the areas of necrosis will also be necrotic. If tumor cell necrosis is in question, additional sampling of the myomatous mass may aid in clarifying the type of necrosis, either through additional foci of tumor cell necrosis or other features characteristic of leiomyosarcoma. 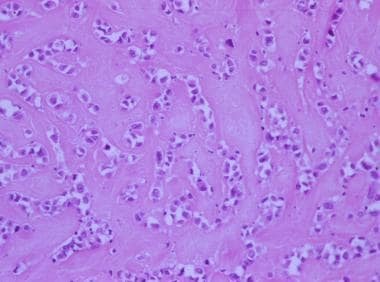 The term "smooth muscle tumor of uncertain malignant potential" (STUMP) is sometimes applied to cases in which there are indeterminate features of malignancy or a combination of features that are unusual and therefore are not reported extensively in the literature. This term should be reserved for cases in which the malignant potential really is unknown, and it should be used sparingly. STUMP is essentially a nondiagnosis, and it is fraught with frustration for clinicians and patients. Most studies of STUMP report benign outcomes, which probably reflect the fact that the term is overutilized. If the tumor has features that are usually benign but if rare cases of recurrence are known, the term "low recurring potential" may be preferable to STUMP, because that term conveys more information about the predicted and known malignant potential. Benign metastasizing leiomyoma is a mitotically inactive, cytologically bland, nonnecrotic tumor that spreads to the lungs and lymph nodes. It may be treated with resection and hormonal therapy. These tumors have a distinct cytogenetic profile. Because the histology of benign metastasizing leiomyoma is identical to that of leiomyomata, the diagnosis is always made retrospectively (eg, in a woman who presents with pulmonary nodules). There are no histologic features that aid in predicting which bland uterine leiomyomata will "metastasize." Intravascular leiomyomatosis is a bland smooth muscle proliferation within vascular channels. It may be focal (demonstrating vascular intrusion) or multifocal and grossly visible. Focal vascular intrusion is usually self-limited. Occasionally, prominent vascular leiomyomatosis recurs within pelvic or abdominal vessels; rarely, it extends into the inferior vena cava and eventually involves the heart. Because leiomyosarcomas may involve blood vessels, the term "intravascular leiomyomatosis" is reserved for those tumors that do not have suspicious histologic features (see the image below). Vascular invasion of a leiomyosarcoma. Myxoid uterine smooth muscle neoplasms (MUSMN) are rare; these tumors have only been reported in a few small studies. The histologic criteria for predicting an aggressive myxoid lesion is fraught with difficulty, because myxoid leiomyosarcomas may be paucicellular and deceptively bland. Their histology ranges from abundant myxoid stroma, reminiscent of a myxoma (see the first image below), to a pulmonary edema pattern in which the tumor cells have thin septaelike alveoli (as shown in the second image below), to a more classic smooth muscle appearance similar to myxoid nodular fasciitis. The myxoid pattern does not seem to correlate with malignant potential. 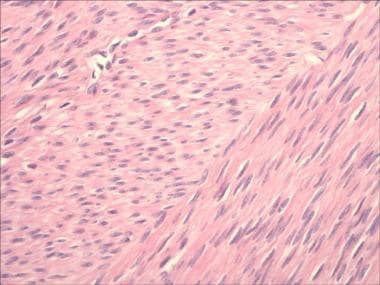 The myxoma pattern of myxoid smooth muscle tumors. This tumor has only minimal atypia. Myxoid leiomyoma with a marked pulmonary edema pattern. Some common features of benign lesions include well-circumscribed borders, bland cytology, and essentially no mitotic activity (fewer than 2 per 10 HPF) (see the following image). Features predictive of malignancy include tumor cell necrosis (regardless of other features), infiltrative borders (recognized by the adjacent normal myometrium splayed and separated by the myxoid stroma), and mitoses greater than 2 per 10 HPF. Because of the dilution effect of the myxoid stroma, some investigators advocate counting 50 HPF to get a better representation of the mitotic index. 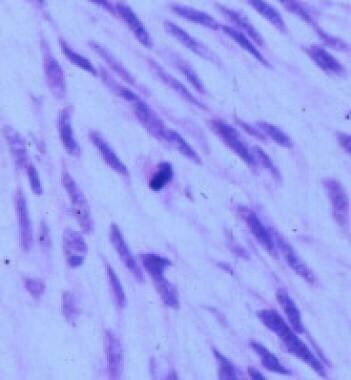 Mitotic figure in a myxoid smooth muscle tumor. 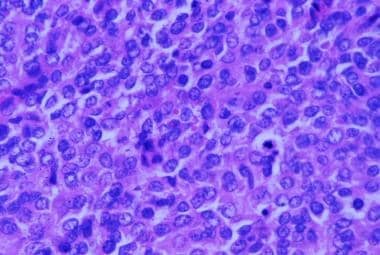 On average, most leiomyosarcomas have at least 2 mitoses per 10 high power field (HPF) (or greater than 10 per 50 HPF). Some early reports of myxoid smooth muscle tumors found that tumors characterized by a mitotic index of 0 per 10 HPF, bland cytology, and infiltrative borders were associated with poor outcomes. Although these findings have not been reproduced to date, they should probably be diagnosed with care; a STUMP category may be most appropriate. Edema may resemble myxoid stroma and may confound the assessment of a smooth muscle tumor. Edema secondary to perinodular hydropic degeneration may cause swelling of the leiomyoma (the authors have seen one that measured 35 cm). Hydropic degeneration is usually characterized by edema centered around the large vessels. This results in displacement of normal smooth muscle cells to the periphery of the edema. The vessels appear to be floating in clear space. 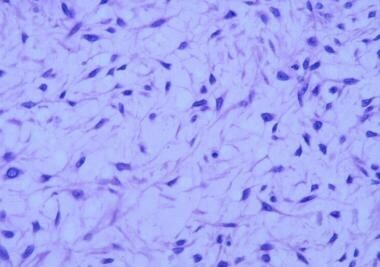 Usually, in a bland myxoid smooth muscle tumor, the tumor cells are small, but in hydropic degeneration, the tumor cells are the size of normal smooth muscle cells. Epithelioid uterine smooth muscle tumors are characterized by polygonal cells with centrally placed, round nuclei. Often, an acellular eosinophilic matrix forms around the cells, giving it an osseous appearance when viewed under scanning magnification. These tumors have been classified under numerous names, including XYZ. As with their myxoid cousins, the threshold for classifying epithelioid smooth muscle tumors as leiomyosarcoma is lower than it is for usual smooth muscle tumors (see the 2 images below). Marked extracellular matrix in an epithelioid leiomyoma. Cellular epithelioid smooth muscle tumor. Epithelioid smooth muscle tumors greatly overlap with perivascular epithelial cell tumors (PEComas). PEComas are tumors of uncertain differentiation that often occur in the setting of tuberous sclerosis. The smooth muscle cells of PEComa share the odd immunophenotype of angiomyolipoma and lymphangioleiomyomatosis and have smooth muscle actin (SMA) positivity as well as perivascular HMB 45 positivity (see the 2 images below). Although uterine PEComas can also arise in the setting of tuberous sclerosis, most are sporadic cases. Perivascular epithelial cell tumor (PEComa) demonstrating the epithelioid and clear cell features. HMB45 immunohistochemical stain of a perivascular epithelial cell tumor (PEComa) demonstrating focal immunoreactivity near vessels. In 2 comprehensive studies by Vang and Kempson  and Folpe et al,  most uterine PEComas had an excellent outcome. However, no reliable features have been found to predict aggressive potential. Some authors have stated that distinction of PEComa from epithelioid smooth muscle tumors is not necessary, and the HMB45 positivity can be seen in otherwise usual epithelioid smooth muscle tumors. However, the tuberous sclerosis genes regulate the Rheb/mTor/p70S6K pathway, and even sporadic cases of PEComa have increased levels of p70S6K. This is a potential area for targeted therapy such as rapamycin, which inhibits mTOR. Thus, although the nomenclature may not matter, genetic assessment might become more critical for possible treatment avenues. Occasionally, epithelioid leiomyosarcomas can be infiltrative and simulate an epithelioid gestational trophoblastic tumor. Premenopausal age, extension of cells into the endocervical canal, or dispersed throughout the endometrium are unusual patterns for leiomyosarcoma. Although the differential diagnosis can be difficult, distinction is easy with immunohistochemistry. Smooth muscle tumors are strongly positive for SMA. 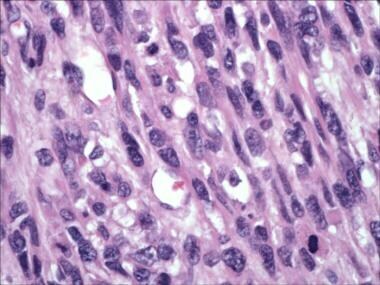 All smooth muscle tumors, and particularly epithelioid leiomyosarcomas, may have patchy cytokeratin positivity. Distinguishing endometrial stromal sarcoma from a cellular smooth muscle tumor may often be achieved with CD10, SMA, and beta catenin. Endometrial stromal sarcoma usually has strong diffuse immunoreactivity for CD10 and beta catenin, as well as patchy SMA positivity. Smooth muscle tumors have the opposite characteristics. However, mixed smooth muscle and stromal neoplasms have been reported. Endometrial stroma and stromal nodules are usually beta catenin negative. PEComas are SMA positive but have HMB45-positive cells centered near vessels of the tumor. 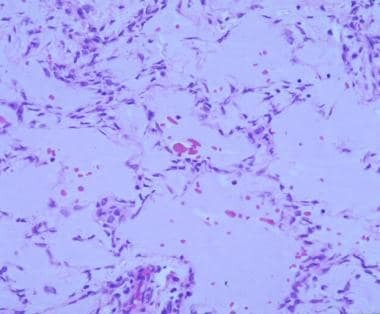 Although this is a characteristic finding in lesions associated with tuberous sclerosis, some investigators have reported this aberrant staining pattern in many smooth muscle tumors, raising doubt as to the viability of classifying these tumors on the basis of HMB45 positivity. Differentiating epithelioid smooth muscle tumor from epithelioid gestational trophoblastic tumor may be achieved with SMA, human placental lactogen (HPL), and placental alkaline phosphatase (PLAP). Epithelioid smooth muscle tumors are positive for SMA and negative for HPL and PLAP. Pan cytokeratin is not useful, because both types of tumors may test positive for this antibody. Immunohistochemistry is not useful in distinguishing sarcomatoid carcinoma from leiomyosarcoma, unless a cytokeratin highlights endometrial glands that were not previously appreciated. Some of the more frequent alterations in leiomyosarcoma include genes in the 1p and 2q area. Loss of heterozygosity near a variety of tumor suppressor genes is commonly found in leiomyosarcomas, and gene expression array studies have identified several candidate genes that are overexpressed in leiomyosarcomas. [15, 16] One of these, p16, has been confirmed to be expressed on the protein level by immunohistochemical studies. This finding may prove to be a useful adjunct in treating patients with smooth muscle tumors. Stage I: Tumor is confined to the uterine corpus. Stage II: Tumor involves the corpus and cervix but has not extended beyond the uterus. Stage III: Tumor extends beyond the uterus but not beyond the true pelvis. Stage IV: tumor involves the bladder or bowel mucosa, or there is distant metastasis. Zivanovic et al compared the staging systems in a cohort of 219 patients and found that although the AJCC system tended to be better at predicting those cases with a good outcome (stage I), the FIGO system was better in selecting cases with a poor outcome. Because the AJCC system takes size into consideration, fewer cases were staged as stage I; patients in this group had a much better 5-year survival than those whose cases were classified in accordance with the FIGO system. However, more cases were upstaged using the AJCC system. Neither system was better for making prognoses across the stages. Leiomyosarcomas tend to spread hematogenously to the lungs, liver, and brain, as well as intraperitoneally to regional pelvic lymph nodes. Using the FIGO system, there is about a 60% 5-year survival rate for patients with stage I tumors. The survival rate drops precipitously for patients with disease of stage II or higher. Stage IV is associated with a 15% 5-year survival rate. Echt G, Jepson J, Steel J, et al. Treatment of uterine sarcomas. Cancer. 1990 Jul 1. 66(1):35-9. [Medline]. Dundr P, Fischerová D, Povýšil C, Cibula D, Zikán M. Myxoid mixed low-grade endometrial stromal sarcoma and smooth muscle tumor of the uterus. Case report. Cesk Patol. 2012 Apr. 48(2):103-6. [Medline]. Burch DM, Tavassoli FA. Myxoid leiomyosarcoma of the uterus. Histopathology. 2011 Dec. 59(6):1144-55. [Medline]. Bell SW, Kempson RL, Hendrickson MR. Problematic uterine smooth muscle neoplasms. A clinicopathologic study of 213 cases. Am J Surg Pathol. 1994 Jun. 18(6):535-58. [Medline]. King ME, Dickersin GR, Scully RE. Myxoid leiomyosarcoma of the uterus. A report of six cases. Am J Surg Pathol. 1982 Oct. 6(7):589-98. [Medline]. Yamada Y, Yamamoto H, Ohishi Y, Nishiyama K, Fukuhara M, Saitou T, et al. Sclerosing variant of perivascular epithelioid cell tumor in the female genital organs. Pathol Int. 2011 Dec. 61(12):768-72. [Medline]. Vang R, Kempson RL. Perivascular epithelioid cell tumor ('PEComa') of the uterus: a subset of HMB-45-positive epithelioid mesenchymal neoplasms with an uncertain relationship to pure smooth muscle tumors. Am J Surg Pathol. 2002 Jan. 26(1):1-13. [Medline]. Folpe AL, Mentzel T, Lehr HA, Fisher C, Balzer BL, Weiss SW. Perivascular epithelioid cell neoplasms of soft tissue and gynecologic origin: a clinicopathologic study of 26 cases and review of the literature. Am J Surg Pathol. 2005 Dec. 29(12):1558-75. [Medline]. Fadare O, Parkash V, Yilmaz Y, et al. Correction: Perivascular epithelioid cell tumor (PEComa) of the uterine cervix associated with intraabdominal "PEComatosis": A clinicopathological study with comparative genomic hybridization analysis. World J Surg Oncol. 2005 May 3. 3(1):25. [Medline]. [Full Text]. Jung CK, Jung JH, Lee A, et al. Diagnostic use of nuclear beta-catenin expression for the assessment of endometrial stromal tumors. Mod Pathol. 2008 Jun. 21(6):756-63. [Medline]. Atkins KA, Arronte N, Darus CJ, Rice LW. The use of p16 in enhancing the histologic classification of uterine smooth muscle tumors. Am J Surg Pathol. 2008 Jan. 32(1):98-102. [Medline]. Hakverdi S, Güngören A, Yaldiz M, Hakverdi AU, Toprak S. Immunohistochemical analysis of p16 expression in uterine smooth muscle tumors. Eur J Gynaecol Oncol. 2011. 32(5):513-5. [Medline]. Quade BJ, Wang TY, Sornberger K, Dal Cin P, Mutter GL, Morton CC. Molecular pathogenesis of uterine smooth muscle tumors from transcriptional profiling. Genes Chromosomes Cancer. 2004 Jun. 40(2):97-108. [Medline]. Quade BJ, Pinto AP, Howard DR, Peters WA 3rd, Crum CP. Frequent loss of heterozygosity for chromosome 10 in uterine leiomyosarcoma in contrast to leiomyoma. Am J Pathol. 1999 Mar. 154(3):945-50. [Medline]. [Full Text]. Skubitz KM, Skubitz AP. Differential gene expression in leiomyosarcoma. Cancer. 2003 Sep 1. 98(5):1029-38. [Medline]. Zhai YL, Nikaido T, Orii A, Horiuchi A, Toki T, Fujii S. Frequent occurrence of loss of heterozygosity among tumor suppressor genes in uterine leiomyosarcoma. Gynecol Oncol. 1999 Dec. 75(3):453-9. [Medline]. Bodner-Adler B, Bodner K, Czerwenka K, Kimberger O, Leodolter S, Mayerhofer K. Expression of p16 protein in patients with uterine smooth muscle tumors: an immunohistochemical analysis. Gynecol Oncol. 2005 Jan. 96(1):62-6. [Medline]. Nucci MR, Drapkin R, Dal Cin P, Fletcher CD, Fletcher JA. Distinctive cytogenetic profile in benign metastasizing leiomyoma: pathogenetic implications. Am J Surg Pathol. 2007 May. 31(5):737-43. [Medline]. Buza N, Xu F, Wu W, Carr RJ, Li P, Hui P. Recurrent chromosomal aberrations in intravenous leiomyomatosis of the uterus: high-resolution array comparative genomic hybridization study. Hum Pathol. 2014 Sep. 45(9):1885-92. [Medline]. Zivanovic O, Leitao MM, Iasonos A, et al. Stage-specific outcomes of patients with uterine leiomyosarcoma: a comparison of the international Federation of gynecology and obstetrics and american joint committee on cancer staging systems. J Clin Oncol. 2009 Apr 20. 27(12):2066-72. [Medline]. Larson B, Silfversward C, Nilsson B. Reappraisal of uterine sarcoma diagnosis in the Swedish Cancer Registry. APMIS. 1990 Jan. 98(1):82-6. [Medline]. Coagulative tumor cell necrosis characterized by an abrupt transition from viable to necrotic cells and ghost cells in the necrosis.